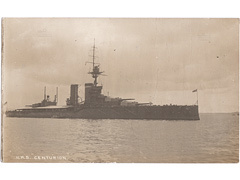 Published by Welch this is a real photographic postcard of HMS Centurion, the card is poorly cut down the left hand side as visible. HMS Centurion was the second battleship of the King George V class, launched in 1911 and decommissioned in 1924 (although sunk as a blockship in 1944). 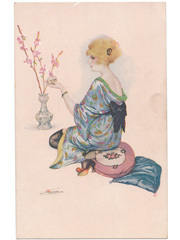 (Postcards, shipping, naval, military, ships).